congenital heart defects | Half Heart. Whole Life. I wake up pretty early for work – just after 5am, usually – and let’s face it, it stinks. No one likes getting up while it’s still dark out and leaving for work while it’s still dark out. For me, however, I got a little bit of perspective over the last few months while leaving for work and – if you’ve read this blog at all – you know that perspective in this journey is an important, and helpful, thing. You see, I used to just wake up, shower, get dressed, let the dog out, give Nolan his morning meds, pack my lunch, make coffee, and then head out to the car and off to work. Boom. Same thing every morning. The last few months, though, I’ve come to give a little bit of appreciation to leaving for work while it’s still dark due to one thing: the view. While leaving for work one day I just happened to look up and – WOW – it was like the sky was darker than usual and the stars were brighter. And it was incredibly beautiful. So then it became a morning thing: go out the front door, lock it, then look up. The moon would shine, you can pick out a constellation or two, maybe a planet like Venus nice and bright in the morning sky. And call me a nerd if you want, but it’s almost breathtaking. You see, where I grew up there was a lot of light everywhere, so seeing the stars wasn’t really much of a thing. You can see some, but it also wasn’t the kinda neighborhood where you hung around outside looking up at the sky. Over time, you take that kind of thing for granted. Yeah, there’s stars and a moon, they’re up there all the time, big deal. I live in the ‘burbs now and while there’s still quite a bit of light, I can see the stars much better now than when I was younger, and now I find myself in awe. How they can be so far away and still seem right there, how we”ll see more of the moon’s surface in our life than our own planet’s (when you think about it). I think about how people navigated using the stars long, long ago, and how amazing it is that – as far as we know – we’re the only living beings out there. Crazy, right? For Christmas, the kids got a telescope as a family gift and I think I was the most excited to use it. I’ve looked at the moon with it several times (most recently the blood moon eclipse, which was amazing), but the first time we set it up and I finally got the moon in view, it was really breathtaking. Even the kids were amazed, and they don’t seem amazed by anything sometimes. The stars, the moon, space…it just leaves me with this amazing sense of wonder. What else is out there? What will we find out in my lifetime? What’s it like to be in space? There’s something about that sense of wonder that I find – I dunno – grounding, in a way. When I look up in the morning sky and see those stars as I’m walking to my car, there’s that feeling of being so small in this great huge universe. And that’s actually ok with me, it doesn’t bother or intimidate me at all. It tells me there’s so much more to know and to learn. And that I’m lucky to be alive, on Earth, to see what discoveries happen next. That’s amazing! Then I get to thinking about being a Heart Dad and I realize that this life is often full of wonder, too, if you stop and think about it. The other day I was giving Nolan his evening meds: he’s sound asleep by this point and I was just kind of watching him sleep and breathe slowly (you parents know all about the “you still alive?” nighttime check). And then it hit me, even though I already knew it – this kid has half a heart. HALF. That’s wild…and it, like, still pretty much functions. Yes, the plumbing is different right now and it’s nowhere near perfect, but whoa. That’s pretty amazing. What does it feel like to have half a heart? I don’t know. I don’t think Nolan can describe it to me at this point, and either way he doesn’t really have much of a reference point for what a “normal” heart feels like. When Nolan gets to running around and playing, or when he’s at the trampoline park jumping around and climbing, you can sometimes forget about his HLHS. And yeah, that gives me a sense of wonder, too. Yes, CHD is stressful and scary, but wow is it amazing what this kid can do and how his body works. Look at our own bodies! Before our heart warriors, I’m certain we really didn’t think much about our own physiology. We didn’t think about heartbeats or circulation or the intricacies of the human body. At least, I didn’t. But man, now that we’re kinda immersed in it, it’s pretty amazing right? It’s amazing how far medicine and healthcare has come. And it’s amazing to see where it will go. I just think sometimes we get too caught up in everything…life hits you hard and fast…and we don’t take time to dwell in wonder about something. It’s a lot like me growing up, not seeing much of the stars and not bothering to really acknowledge that they were there. But now I can take the time and I have the ability to see them and be amazed. Often we let fears and anxieties of the CHD life consume us. I’m not saying it’s wrong to be afraid, or that it’s wrong to be anxious. I understand and accept that those things will always be there and they hit me, too. But I wonder what it would be like if every once in awhile we stop, open our eyes and our minds, and just dwell in the wonder that is our heart warrior….or the wonder of the human body, or the ocean, or space, or animals, or nature, or whatever. I’m willing to bet that in those moments when it feels like life is spinning just a bit (or a lot) out of control, letting wonder keep you grounded with help you a great deal. I know it does for me. So maybe get out there early in the morning or at night, take a few deep breaths, and look up. The stars are out there waiting. This post is totally a shameless plug, but I guess it would be crazy of me not to put it on here. A few years ago we did a fundraiser where we sold Team Nolan t-shirts: they were great quality and everyone loved them. From time to time people have asked when we would consider doing it again, and we felt now is a good time! The fundraiser will end on June 20th and all orders will print and ship once the sale ends. Note: we do need to sell a minimum of 11 shirts in order for the company to print and ship them, so every bit of support helps! We’ll be using the funds from these shirts to help with the little things that always seem to come up: syringes for medications, supplies for school, clothes/shoes, etc. They don’t seem like much but as you know, sometimes those things pile up. As always, we are so thankful for your love and support! You guys are awesome! What is the Norwood Procedure? The Norwood Procedure is the first surgery for all HLHS babies and usually occurs sometime during the first week of birth. It is the most complex and highest-risk procedure that an HLHS baby will go through. Since the heart’s left side does not pump well, the heart is rebuilt so the right side of the heart becomes the main pumping chamber. The blood vessel leaving the right side of the heart called the pulmonary artery is divided. The far end (the end closest to the lungs) is sewn shut. The near end (the end closest to the heart is sewn into the aorta, which is the large blood vessel leaving the left side of the heart. A patch is sewn in this area to make the “new aorta” or neo-aorta bigger and stronger. Now all the blood leaving the heart goes from the right side of the heart through the pulmonary valve and out to the body through the new aorta. The wall between the heart’s two upper chambers is removed. This allows red blood coming back from the lungs to flow from the left upper chamber to the right upper chamber. The blood then goes to the right lower chamber and out to the body. 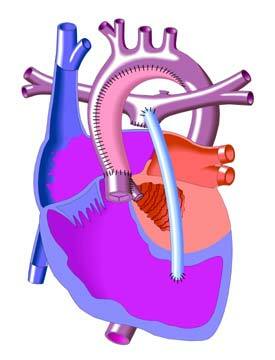 After the Norwood, the right ventricle pumps blood to both the lungs and the body. The Norwood procedure re-routes the blood flow around some of the defective areas of the heart by creating new pathways for blood circulation to and from the lungs. Nolan will be having a variant of this procedure called the Norwood-Sano, which means that a Sano shunt is being utilized. The Sano Modification of the Norwood involves the placement of a conduit (light blue tube in the picture above) between the pulmonary artery and the right ventricle. The recovery period for the Norwood procedure averages 3 to 4 weeks, but please don’t be surprised if it’s longer (you’ll see). I can’t stress enough how serious of a procedure the Norwood is: it’s not a simple 1-hour fix, and it’s only the first of 3 surgeries an HLHS baby will need.